A 700 year-old Buddhist temple in Thailand contains something visitors might find unusual: a blue robotic cartoon cat from the future. That's right, iconic anime character Doraemon. Earlier today, Japanese website Gigazine introduced Buddhist temple Wat Sampa Siw, which features paintings of anime character Doraemon. This certainly isn't a traditional Buddhist motif, and as the Bangkok Post previously reported a while back that some people were not happy with the animated cat's inclusion. "It's to express my sense of humour. When I was in a fun mood, I painted Doraemon on the mural," artist Rakkiat Lertjitsakul, who painted the mural, told the newspaper. "It's to express my sense of humour. When I was in a fun mood, I painted Doraemon on the mural." Lertjitsakul was brought in to do repairs after the mural was damaged during a flood. When the news originally broke, a temple representative is quoted by Coconuts Bangkok as saying artists were allowed to paint what they want as long as the work teaches Buddhist morals. So now, visitors can see that even Doraemon experiences the law of Karma. However, CNTV reported that the monks had no idea the robot cat would end up on the murals. "We thought it was lovely and didn't want to remove it," monk Pladkantaphat Kittimetee told CNTV. "Besides, it has attracted a lot of children and young people." Lertjitsakul has been a Doraemon fan since he was a little kid. And as he points out, the character can't really be seen, unless you really look for him. However, there are now Doraemon statues on the temple's ground that you can't help but noticing. 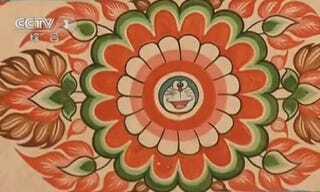 "The Doraemon [images] should draw children to the temple," explained the artist. "At first, they might come to see the cartoon but once they are here, they will be immersed in something virtuous." The temple certainly seems open to modern day popular culture as it also features Angry Birds characters. Be sure to check Gigazine for more photos of some of Thailand's most unique Buddhist temples.